An accurate and rapid diagnosis is required for cancer therapy. Throughout low- and middle-income countries (LMICs), patients and health workers lack access to diagnostic tools and educational resources that are instrumental to an effective cancer diagnosis. To achieve comprehensive cancer control it is essential to improve diagnostic capabilities for all patients and meet the gaps in LMICs where cancer mortality is highest. Cancer diagnostics requires trained personnel, routine and specialized reagents, laboratory equipment, standard operations procedures, ongoing quality management and standards/harmonization of process and reporting. In Sub-Saharan Africa (a region with high cancer mortality and a lack of diagnostics), it can take months for patients to receive a cancer diagnosis (if at all) after seeing a health care provider, which may lead to development of an advanced staged malignancy. 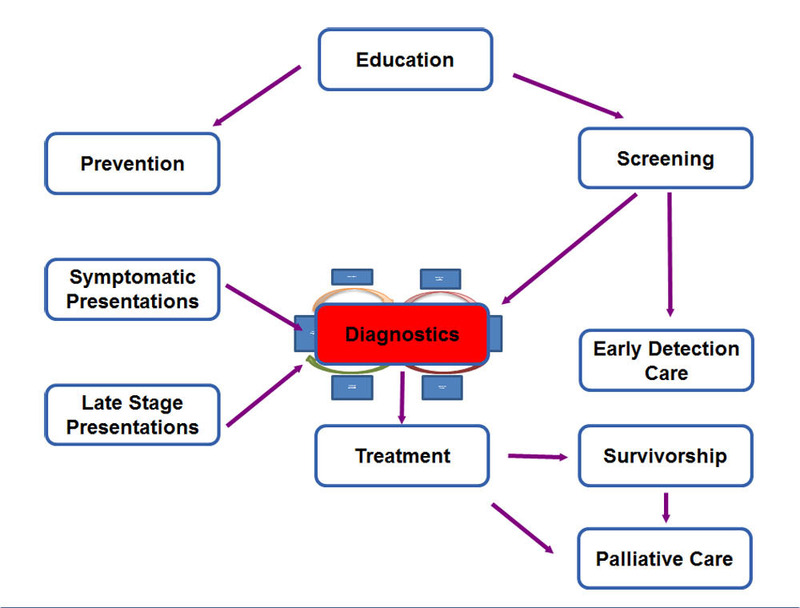 A pathological confirmation of a malignancy is critical to a timely cancer diagnosis and initiation of proper treatment as well as crucial to the creation of national population-based cancer registries (less than 20% of the population have registries as of 2006), which enable experts to evaluate and improve diagnostic methods and treatment programs. Increased pathology capacity, as well as awareness of efficient diagnostic methods in both the anatomic and clinical pathology laboratories, is a necessary step to obtaining an accurate and timely pathological diagnosis in LMICs. To access the legend of the figure above click on More below. The cancer care continuum, in schematic view, has multiple interconnected parts that are all essential for a total approach to reducing morbidity, mortality, and incidence of cancer. Education and knowledge on early warning cancer signals is part of a population approach to prevention and is key for bringing people into contact with health services. In some settings, certain types of screening (such as “visual inspection with ascetic acid” or VIA for the cervix) may result in first contact procedures (cryoablation therapy of small lesions) that can be considered as “Early detection care” as the risk of cancer for that patient has been eliminated. Although in an ideal setting, any tissue with suspicion of pre-cancer or cancer should be sent for pathology, the use of VIA with immediate therapy is a powerful tool to reduce risk of cervical cancer in women even though it may result in some overtreatment. During screening when larger lesions (not compatible with immediate “early detection care”) are detected, as well as when patients present symptomatically or with obvious potential late stage disease, it is essential that a diagnostic test be performed before considering further therapy. Malignancies can mimic each other but also be mimicked by infectious diseases, particularly in LMICs. For example, a “late stage clinical breast cancer” in an LMIC that, on pathology, may be breast cancer (requiring testing for hormonal receptors), lymphoma, or tuberculosis). A pathological diagnosis for solid tumors, as well as a variety of tests for biomarkers, liquid tumors, and prognostic indicators, all create the data a clinician needs to form a specific treatment plan for each patient. Appropriate treatment leads to cancer survivors or, at a minimum, an appropriate palliative care program to maximize outcomes for the patient. Just like each aspect of the cancer care continuum, there is more to each of these pieces than a simple process, rule, or procedure. 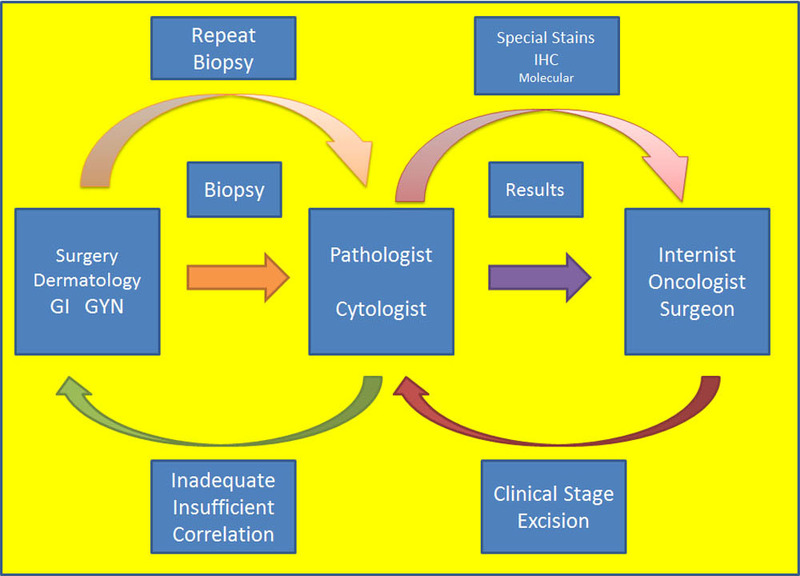 In, for example, diagnostic tissue pathology for solid tumors, the system can be illustrated by this schematic which highlights both the complex nature of the process as well as the need for constant communication between the team members. Because any clinician may collect a tissue sample (or blood sample) for testing by the laboratory, specific knowledge about the goals of that sampling and the results to expect from the laboratory are crucial. Immediate feedback is often built into modern laboratories in high income countries (HICs) such that adequacy, quantity, and clinical data are easily reported between the laboratory and the clinician (which may result in repeat procedures as needed). When a pathologist or other laboratory professional reports a test result, it is essential that there be someone to receive that result and act on it- such as an oncologist in the case of cancer. But the single result may be insufficient for planning care and require ongoing communication with the pathology for specific questions, additional testing, or clinicopathological conference discussion to develop a treatment plan. In HICs, this continuum within diagnostics is often taken for granted while in LMICs, missing even one piece of this diagram can lead to disastrous turnaround times, inaccurate results, and lack of appropriate care for patients. Thus, the larger cancer continuum of the previous schematic in which Diagnostics is the central piece has a required set of tools and processes that must be in place within Diagnostics to function and contribute optimally to the cancer continuum. Current barriers to an accurate cancer diagnosis for patients in LMICs include lack of awareness of cancer risk factors and early warning signs, sustained infrastructure, sufficient numbers of trained personnel (i.e. community health workers), and access to available treatments. Organizations and individuals with expertise in pathology, laboratory systems, and oncology need to work together to improve local facilities in order to increase the validity of diagnostic outcomes and provide patients with necessary treatments. Facilities can be improved through laboratory strengthening with equipment, reagents, and education; by training health workers on how to perform cancer diagnostic tests; and by building strong partnerships between organizations in LMICs and high-income countries. Histopathology services were implemented in Butaro, Rwanda to combat, among other challenges, a very long turnaround time for cancer diagnostics. In January of 2012, laboratory infrastructure, personnel, and activities were investigated and documented to create an assessment report that detailed the resource needs at Butaro, identified where resources could be made available, and outlined a timeline for phased capacity building. Three months later, laboratory equipment was provided to the facility. The following month, two laboratory technicians were selected to undergo training in histotechnology, after which they began processing tissue specimens with support from on-site histotechnologists from the United States. After implementation, specimens from various facilities in Rwanda were submitted, processed, and sent to Butaro. The median time from specimen receipt to the final result was 32 days. Since 2014, challenging pathology cases received at Butaro have been photographed and presented to a group of specialist pathologists from around the world using a static-image telepathology system, which transitioned to whole slide imaging in 2016. Following the appointment of a full time pathologist at Butaro, the number of challenging cases uploaded as whole slide images in the last year (2016) averages 16% of all 1411 cases reviewed using WSI. Diagnoses are successfully generated for 90.5% of these cases and turnaround time has dropped to ~69 hours.